Muzaffarnagar district is under grip of communal insanity, according to official figures till now 19 people including a journalist in the line of duty has been lynched to death. This riot is not a spontaneous reaction to some flare up, but a result of well organized campaign to fan communal tensions. It all started with the killing of three youngsters in clashes on August 27 in Kawal village over eve teasing. Two youths belonging to Jatt community Gaurav and his cousin Sachin of Malikpura village attacked Shahnawaz of Kawal village with knives after he passed lewd remarks on their two female cousins. Shahnawaz suffered serious injuries in the attack and died in the hospital. 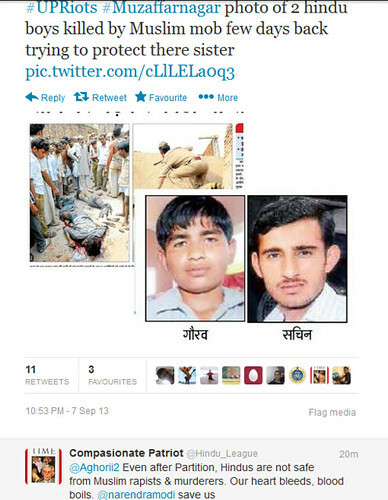 Shahnawaz relatives and his local villagers caught hold of Sachin and Gaurav and killed them in mob beating. Going by the track record of Khap dominated Western UP those killings was not a unique case in the region. But tensions did flare up as predators and teasers were from different communities. But this didn’t end here; political strategist found potential of dynamite in the incident and started to prepare the ground for the explosion. Fake videos of ‘killing of Hindu youths by Muslim mob while they were protecting the honor of their sister’ were circulated through mobile phones and internet. The horrific video showed men in beards and traditional Muslim attire killing two youths mercilessly. That disgusting video is originally from Pakistan of infamous 2010 killing of two brothers in Sialkot Punjab province by lynching mob who misidentified them as dacoits. Fake video was edited to incite the passion to illustrate typical bearded Muslims killing helpless innocent Hindu boys who were just trying to protect honor of their sister. The video traveled like a wild fire and shared by many people, shockingly including local BJP MLA from the region, BJP MLA from Sardhana constituency of Meerut district Thakur Sangeet Singh Som shared the video on his Face Book profile asking people to ‘see what is going on in Muzaffarnagar’, 500 local right wingers distributed it immediately (he has removed it now after a case was filed by UP police). 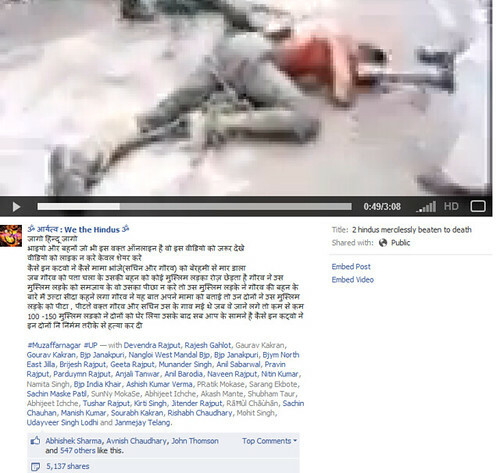 That Pakistani Video clip was so popularized in the district that even widely circulated Hindi news paper like Dainik Jagaran in its local edition printed the screen shot image of that Pakistani video clip and showed one of the boy lying on ground in blood surrounded by an apparent Muslim crowd, appallingly without even cross checking the authenticity of the video. 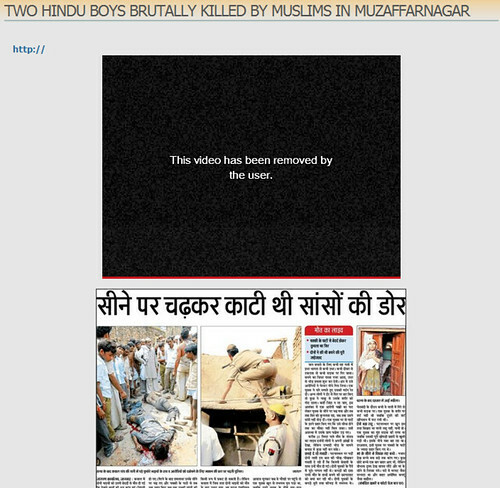 That print news item of Jagaran with screen shot image of Pakistani video came as a blessing for hate mongers who then started widely circulating the forged news item to weight their claim behind the Pakistan Sailkot killing video to present it as Muzaffarabad, Kawa killing clip of two Hindu jatt boys. Sensing trouble police immediately tried to block the video clips from the internet and filed FIR against the BJP MLA and other 229 unidentified persons for sharing the video was registered. They have been booked under Sections 420 (forgery), 153-A (promoting enmity on religious grounds) and 120-B (conspiracy) of the IPC and Section 66 of the Information Technology Act at the Kotwali police station in Muzaffarnagar. Such was the determinant plan for communal riots that even after blocking the video on internet, fringe groups distributed CDs of that fake video. Local right wing leaders giving weight to the fake video gave a call for Mahapanchayat defying prohibition orders and created law and order situation. Elders of two religious groups were invited to sort out the simmering tension between the two communities. Police said a bus headed for the mahapanchayat was stoned near Basi village, resulting in injuries to six people. As news spread, people of both communities pelted stones at each other. In that Mahapanchayat meeting literally called to discuss the issues arise through fake videos, four people were killed and five others were injured in passionate stone pelting. From then on fake video and images has already done their job, whole district in now under fire. Dozens killed, scores has injured with army called in to control the mob fury. Five companies of PAC and five of RAF and police have been deployed in Muzaffarnagar. But the menace doesn't stop here right wingers is circulating those fake pictures of Pakistani video with Hindi bi lines to incite passion of Hindus. Several FB pages related to Hindutva organisations and individuals, and on other social media like Twitter the video was vigorously shared. This could have repercussions in other parts of the country as well. It appears more than clear that Muzaffarnagar communal riot is a well orchestrated plan to polarize western UP for mission 2014.